← Toontrack today release Seventies Prog Grooves ! 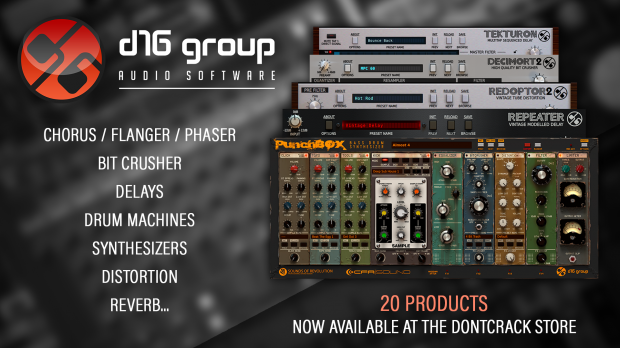 We are very proud and excited to have D16 Group Audio Software products for sale at the DontCrack Store. Their premium audio plug-ins are a great addition, and three of them, Drumazon, Nepheton and Nithonat are on promo right now during our ‘Drum Month’ special. D16 Group Audio Software officially launched in 2006 with the aim of producing top-quality virtual instruments and effects to inspire musicians and producers. Today, D16 Group Audio Software is known for creating premium audio plug-ins. Their sustained desire to maintain the highest level of quality pushes them to deliver virtual instruments that set a new standard for sound, and effects that take creativity to the next level. The trust and respect they have built for theirr products in the audio community has set D16 Group as the company of choice for musicians the world over. This entry was posted in DontCrack, Plug-ins, Promotions, Sounds, Virtual Instruments and tagged Antresol, Bass Drum Synthesizer, bit crusher, Classic Boxes Collection, D16, D16 Group Audio Software, Decimort 2, Devastor 2, Double Path Analog Chorus, Drum Machine, Drum Sounds Collection, Drumazon, Fazortan 2, High Quality Flexible Delay Unit, LuSH-101, Multiband Distortion Unit, Multitap Sequenced Delay, Multitimbral Polyphonic Synthesizer, Nepheton, Nithonat, Phaser, Phoscyon, Plasticlicks, PunchBox, Redoptor 2 Vintage Tube Distortion, Repeater, Sigmund, SilverLine Collection, Space Modulated Reverb, Syntorus, Tekturon, Toraverb 2, Total Bundle, Vintage Modelled Delay. Bookmark the permalink.